Home/Latest News From Kalamazoo Industries/Do I need a belt grinder and or a belt sander for my application? 1. Do want to do general removal? 2. Do you want to really hog some metal? Then once we know to the answer to either of these questions then we continue to ask a series of questions to make sure we find the right solution for them. The belt sander was designed to do general material removal and the only area that you would sand on to do that metal removal is the platen. Also the SFPM of the belt sander is typically slower than the SFPM of the belt grinder which is typical double from what the SFPM of the belt sander. The belt grinder was designed to do heavy and quick metal removal. The belt on the grinder typically travels faster so there is quick metal removal and minimal heat build up. So give us a call with your application and let us help you find a solution to your project. We can be reached at (269) 382-2050. 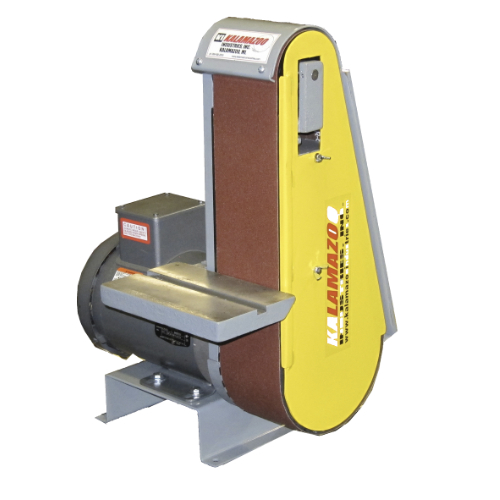 Also go to our belt sander web page by clicking here and or go to our belt grinder page by clicking here to see what we have to offer. This article “Do I need a belt grinder and or a belt sander for my application?” will help you and give us a call. By Admin|2019-02-08T08:21:47-04:00February 8th, 2019|Latest News From Kalamazoo Industries|Comments Off on Do I need a belt grinder and or a belt sander for my application?